This Guestbook is Private. Messages will be emailed to the family. 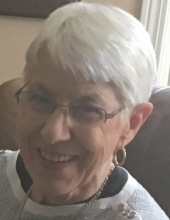 Dixie O. Fixmer, 82 of Rhinelander, passed away on February 8, 2019, at the Friendly Village Nursing Home, in Rhinelander. She was born on September 11, 1936 in Wausau, Wisconsin to Ernest and Pearl (Brady) Dupuis. Dixie grew up in Mosinee, Wisconsin. She attended schools there graduating from the Mosinee High School in 1954. She then attended the U.W. of Eau Claire and Saint Mary’s School of nursing in Wausau. She received her degree in nursing from St. Mary’s. Dixie married John Fixmer in 1958 and they enjoyed over 60 years of marriage. They moved to Whitewater where John was attending college and she commuted to the Fort Atkinson Hospital where she was employed as a nurse. Upon John’s graduation in 1961 they moved to Wausau until 1968. They then moved their growing family to Rhinelander where they lived until returning to Wausau in 1988. After John had begun his career, Dixie focused solely on raising their kids and caring for their family. They remained in Rhinelander until all the kids graduated from RHS. As many families, this included many practices, meets and games that Dixie made sure the kids were at, and on time. Dixie would say she enjoyed every minute of it. After their return to Wausau, the second time, Dixie and John enjoyed going back up north on weekends to their cottage on Lake Mildred in Rhinelander. After John retired in 1996, they moved to their Lake Mildred Cottage. They spent most of their time there with the exception of the winter months in Tucson Arizona. They recently moved to the Lake Park Condos on Boom Lake. Dixie enjoyed many activities with family and friends. She also enjoyed her volunteer work with church, hospice, the American Cancer Society, school, and other charitable groups. Her interests included bridge, golf, cooking, traveling, quilting, knitting, playing video poker, reading and crossword puzzles (every night) and visiting with her many friends. She and John were longtime members of both the Rhinelander Country Club and the Wausau Country Club. Her faith was important to Dixie and as a family they worshipped their Lord and Savior as longtime members of the Nativity of Our Lord Catholic Church. She will be missed by her family and many friends. Dixie is survived by her husband John, her daughter Ann Prokop (Jason Haskins) of Wausau, WI, her son Mike (Carolyn) Fixmer of Holmen, WI, her grandchildren Melissa Fixmer, John Prokop and Adam Prokop, her brother Tom (Ginny) Dupuis of Winfield, IL, nieces, nephews, other family and many friends. Dixie was preceded in death by her daughter Nancy Fixmer, her sister Nancy Finucane and her parents. A Mass of Christian burial will be celebrated at 11:30 am on February 15, 2019 at the Nativity of Our Catholic Church in Rhinelander with Father Michael Tupa officiating. There will be visitation from 4:00 to 6:00 PM on Thursday, February 14, 2019, at the Carlson Funeral Home and also from 10:00 AM until the time of services on Friday, February 15, 2019, at the church. Interment will follow the services in the Nativity of Our Lord Catholic Cemetery. A memorial is being established in Dixie’s name for the Ahlzheimers Association and may be directed to her family. Dixie’s family would also like to thank the staffs of the Friendly Village and Ascension Hospice for the wonderful care they provided these last few months. You may leave your private condolences for the Fixmer family at www.carlsonfh.com. The Carlson Funeral Home (715-369-1414) is serving the Fixmer family. "Email Address" would like to share the life celebration of Dixie O Fixmer. Click on the "link" to go to share a favorite memory or leave a condolence message for the family.